The play of shadows in this portrait is remarkable. Working with hard light, the photographer turned the bride's face away from the camera and put the light onto its front planes. Her body was turned toward the camera, letting the light skim across it and pick up all the texture on her bodice and tulle skirt. 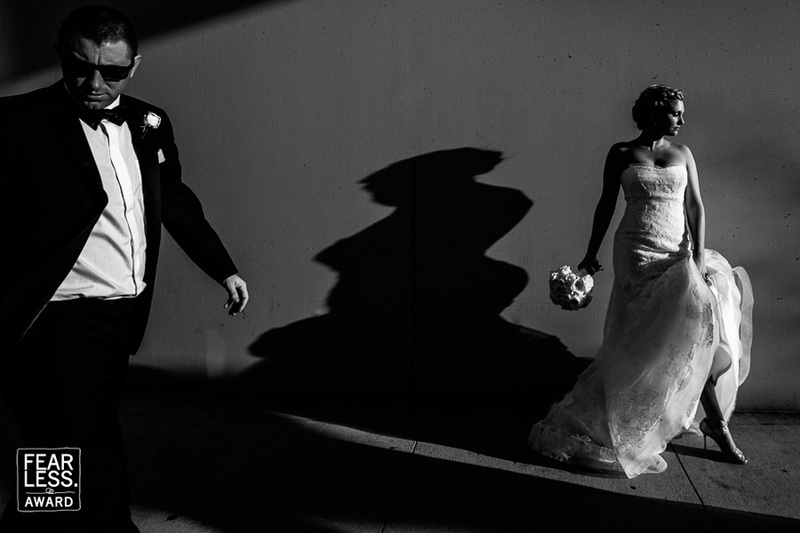 On the wall, her crisply distorted shadow reaches back toward the groom. His pose (face toward the camera, body in near profile) is nearly the opposite of hers, yielding a completely different effect. Diagonal shadows on the wall and ground complete the dramatic, high contrast portrait.